Melbourne Bride: "Make It Your Own"
If you’ve ever wanted to make your own jewellery, why not start with your wedding band? Ali Klaver talks to Lars Larsen of Larsen Jewellery to find out how you can do it. How does the self made ring service work? 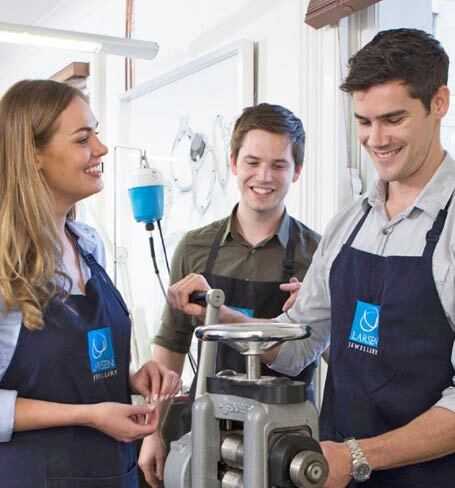 Under the guidance of an experienced jeweller you will melt your chosen metal, and mill and shape the rings before polishing them until they shine. The process is surprisingly easy and with the close guidance of an experienced jeweller, anyone can do it. It takes about four hours – from choosing the ring design to seeing the final product. The process is fun and personal, and you only have to put in as much work as you want to. Is the process overseen at every stage to ensure quality? One of our experienced jewellers will guide the couple on a one-to-one basis to make sure the rings end up perfect. The process has been designed to allow couples to handcraft the rings themselves, but the jeweller can do any part that you’d prefer not to do. The rings are guaranteed to be of the highest standard as they are handcrafted using traditional techniques and the highest quality metal alloys. Is it possible to make something other than plain wedding bands? We offer a wide variety of designs, combinations of precious metals, patterns and the setting of precious stones. You can choose from white gold, yellow gold, rose gold or platinum and a wide range of diamonds and other stones. The couple can make the basic rings and leave them behind for one of our experienced jewellers to finish. You can add personal touches such as incorporating heirloom jewellery and engravings. The jeweller also makes sure the wedding band fits perfectly with the engagement ring. Prices start at $1,500 for two 18-carat gold wedding bands, which includes the assistance of an experienced jeweller on a one-to-one basis throughout the process. We also include: nibbles, beverages, a glass of champagne to celebrate with at the end, photos to keep as a memento and a lifetime of annual polishes to keep the rings in sparkling condition. What else does Larsen Jewellery do? We also specialise in custom designed jewellery, including engagement rings and wedding gifts, and provide diamonds and other precious stones at workshop prices. All our jewellery is of the highest quality and handcrafted at our workshop in Sydney’s Strand Arcade and in Melbourne’s iconic GPO building. Please click here for more information about wedding rings in Melbourne.